A strategy for how to understand or teach the game faster. Being a good ultimate player is as much about being able to see the field and anticipate what will happen as it is about being fast, having the throws, and skying your opponent. Pit a group of young, athletic pick-up players against a masters team, and you’ll see the masters team win more often than not, simply because of how well they understand the game. Understanding the game, however, is not easy. It’s difficult to break down a point of ultimate into its constituent pieces, because of how much goes on, every single second, and how much a point can change as it flows. Additionally, the lack of game stoppages and constant grind of play makes it hard to turn on-field mistakes into teaching moments: A rookie’s failure to seal off a dump throw, allowing a continuation swing pass and then a peek at the exposed side of the field, can happen in the middle of a long sequence. By the time things have settled down and there’s an opportunity to tell them about what they could’ve done better, it’s forgotten by most, and only vague in the minds of the rest. This makes it crucial to make the most out of any teachable moments that do come your way, both for inexperienced players and for captains or coaches. It’s clear which situation each of these fundamental skills lessons belong to: Marking is for defense, guarding the disc; throwing fakes is for offense, with the disc; closing space is for offense, off-disc; and face-guarding is for defense, off-disc. However, smart players and coaches can apply one of these fundamentals to the other situations as well, gaining valuable insight into the game. This is what Bonus Lessons are: applying lessons about fundamentals to situations that they were not originally meant for. Inexperienced players can use Bonus Lessons to speed up their understanding of the game by moving a fundamental from the one situation it was meant for, and thinking about its implications on the other three. Coaches can use Bonus Lessons to contextualize the importance of a certain skill, by showing how it’s interrelated with the rest of the game. You’re on defense, guarding an off-disc handler. Your team is forcing flick. They’re looking to reset the disc off the force sideline, and your person makes a dump cut. You know that you can’t make a play on it. It’s important, therefore, to set your mark so that dump cut doesn’t turn into a continuation swing throw to the break side. A potential Bonus Lesson, then, would be to shift the perspective to Situation 1. You’re now the handler, making that dump cut. Your eyes are on the disc and you’re attacking it, but you know that your defender is probably swooping to prevent that continuation pass that you want. If your team’s offensive system wants that disc to make it to the break side, then you should still try getting it there. An around backhand could do the trick. But what if the mark is there “swooping” already? Quickly fake the around backhand, and then hit the continuation swing anyway with a breakside flick. Your defender should have too much momentum from rushing to seal off the swing, to then get back in position to stop a flick. Develop that throw, and learn how to sell that particular fake to make defenders bite on it every time. Good coaches and smart players will see how Bonus Lessons open up double (or even triple) Bonus Lessons in other situations, or can “ping-pong” back to the original situation. This play is fodder for a Double Bonus Lesson in Situation 2: on offense, but without the disc. You can cut as normal, and hope that another cutter provides that flick option for your handler. This leads to another possibility in Situation 2: If you’re not in position to be the continuation cut to which the dump handler is looking to swing, make a secondary cut for that handler to flick a skinnier, up-field break throw to. You could probably then bounce a dump pass to that original continuation cutter even further on the break side, putting them in power position. This is a good time to “ping-pong” back to Situation 3: on defense, guarding the disc. Yes, if you’re guarding that dump cut, you need to prevent that continuation swing. But don’t over-pursue, because this opens up an equally dangerous flick up the break side. Something to consider as you set this mark on the dump throw: Bait that fake, and be there to stop the flick. You can even give a Triple Bonus Lesson here, and take this scenario into Situation 4. 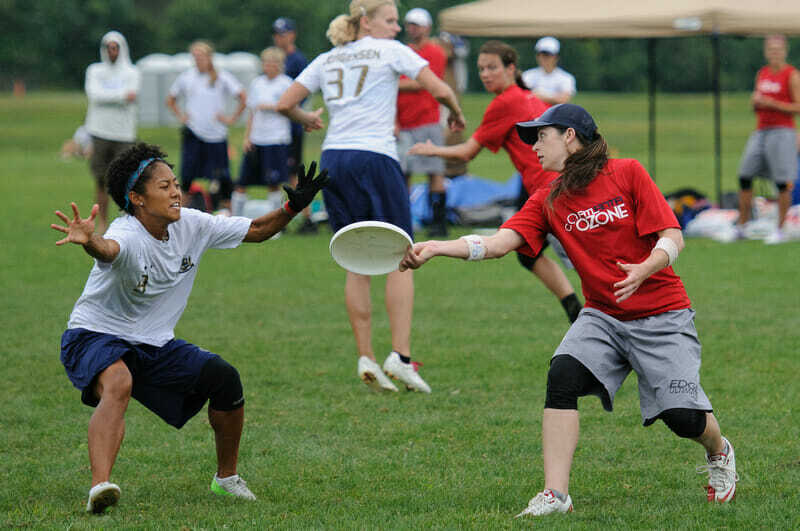 If you’re on defense up-field, and you see the other team executing a dump cut to get the disc, know that this is a good time for them to look to attack the break side. Tighten up on your person to eliminate any cushion you’ve left them, and to get your momentum going to the break side so you can better challenge your player if they make a cut over there. Good coaches can use Bonus Lessons to double or even triple the amount of information that they can get across in an average coaching session. This should not confuse or overwhelm newer players, as Bonus Lessons come within the same context as the original lesson, and merely utilize a different perspective on the game. Bonus Lessons should be a much better teaching tool than simply telling players what to do in each separate scenario. Without a common context, it’s difficult for newer players to see it effectively. Additionally, smart players can use Bonus Lessons to pick up the crucial fundamentals of the game quicker than others. Note that “smart players” does not mean “experienced players.” Inexperienced players can use Bonus Lessons to take their comparatively little on-field experience, and mine it for more knowledge of the game than other players do. Smart players do not stay inexperienced for long. Comments on "Tuesday Tips: Using ‘Bonus Lessons’ To Learn Faster, Presented By Five Ultimate"